01-07-2016 - Do You Remember Leuzinger Coach/Counselor Jim Chadwick? A 90 year old retired Leuzinger High School football coach fired a gunshot into a wall and held an intruder for police early Wednesday, minutes after he awakened to find the man in his Hawthorne home. Jim Chadwick, who coached at the Lawndale high school from 1951 to 1960, said it was the first time in 40 years he ever had to pull out and load his .38 Special handgun. "He sat up on the end of the bed and moved toward me," Chadwick said. "I said, 'Don't move. I'm going to fire.' So I fired into the wall just to let him know the gun was loaded. He sat back." It wasn't clear why the intruder had entered Chadwick's house near Richard Henry Dana Middle School. He didn't appear to be taking anything. Instead the intruder laid down on a bed and might have been drifting off to sleep. Chadwick said he had awakened about 3 a.m. and noticed a figure in his bedroom. The figure moved into a lighted hallway near his 89-year-old wife's bedroom so he quickly got out of the bed, opened his gun chest and loaded the gun. "I went directly into my wife's bedroom to see if she was all right," Chadwick said. "She was OK, asleep. I walked into another back bedroom that we have that's vacant, and there was an individual lying on a twin bed in there." Chadwick said he called 911, awakened an in-home caregiver who was asleep, and moved into the room where the man was lying on his side either asleep or close to it. Chadwick said he woke him up, ordered him not to move and fired into the wall. "A human life is worth too much to just go shooting someone," Chadwick said. The man apparently had entered the house through an unlocked sliding door. It was not clear that his intention was burglary. He might simply have been looking for a place to sleep. "That's what went through my mind," Chadwick said. "He might be one of the homeless near Costco. He left a pair of shoes in my bedroom and they were all wet. So it could be very possible he was homeless and came into sleep. The police officer said he could have been drinking." Chadwick, who uses a walker most of the time, somehow got out of his bed, loaded his gun in the dark, and walked without the walker during the confrontation. He did not use it when he went outside to speak to police. "He doesn't know how he walked through the house," said his son, John Chadwick. Raised in Santa Monica, Chadwick played football for Santa Monica High School. 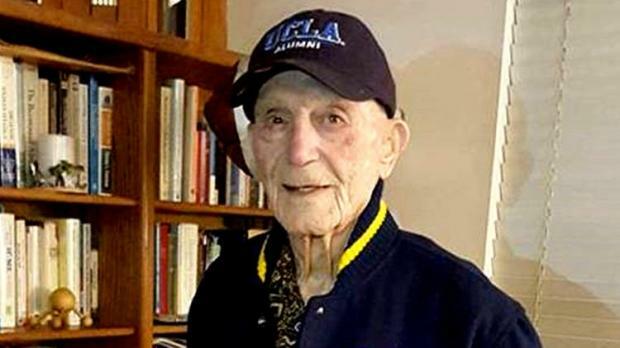 He served in the U.S. Navy from February 1944 to June 1946, and was a UCLA running back in 1948 and 1949. He taught at Leuzinger for 35 years, retiring in 1985. He and his wife raised 7 children and have 15 grandchildren and 12 great-grandchildren. Chadwick turned 90 in October. "He still has a lot of life left in him," said Chadwick's grandson, Sean Skifstrom. "He used (the gun) in a correct fashion and no one was killed." The intruder spent Wednesday in Hawthorne's jail, awaiting an interview with detectives. Investigators said they believe he lives in the neighborhood, was intoxicated and went to the wrong house. It was unclear whether he would face charges.